Likud Anglo activists at a convention of Likud's Central Committee. Yuval Biggs, Ariel Pulver and Ariel Solomon. TEL AVIV, December 15, 2011--Several Likud Anglos activists attended the meeting of the Central Committee to learn about the inner workings of the Likud and talk with Members of Knesset and important Likud members about Likud Anglos and its mission. The Central Committee approved the changes requested by the Prime Minister, to enlarge the representation of city-residents on the Central Committee (aimed at lessening the representation of settlement-residents, who were given greater representation on the Committee) and to advance the date of the primary for the Chairmanship of the Likud to January 31st, the date of the Central Committee elections. Netanyahu speaking to the Likud Central Committee. With Knesset Speaker Reuven Rivlin. The Prime Minister spoke against violence against IDF soldiers, referring to the protest at which teenage settlers were accused of breaking into an IDF brigade base, burned tires, spreading nails on a road, throwing stones and paint bottles at vehicles. 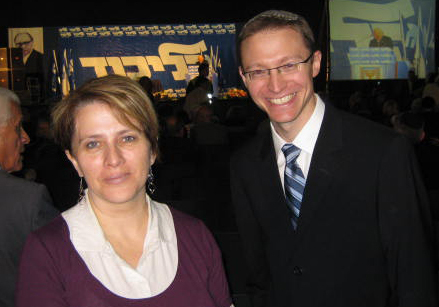 (Here’s the Jerusalem Post story). He also noted that by and large residents of settlements are peaceful and loyal citizens of the State. Sonia Graham and Daniel Tauber.